I may very well have to add a pump to get it through the sediment portion. If do I'll just use a 12v rv style one. Originally were not going to tie into grid power but I have been convinced by higher command that we are. So it will be nice to be able run my welder without a generator. Also running a well pump in the future was going to be pretty costly on solar. I'm still going to have an auxiliary system for lights, USB charging and an invertor big enough to run my freezers. Just replaced gaskets in my woodstove and punched the tube. Make sure you check that and the bricks folks. That sounds great. What type of solar set up? It will be like the one I put in the Greenhouse, only I will have the ability to make it much larger. This is the GH set up. Nice, TFG. Panel swivel with sun? If anyone is considering a solar system there are a few considerations. The amount of solar insolation in your area (charts available online), adequate storage and panels sized to keep the batteries charged given the solar insolation for the time of year. MPPT systems help greatly to enhance energy production on less than ideal days and a pure sine inverter helps a bit with energy loss. Overall these systems work well but are inefficient in the long run. That being said they are a truly independent system with some great benefits on a small scale. Wind turbines could also be included in the system. Keeping batteries from going through full charge/discharge cycles prolongs their life. When I have sized systems in the past it was using the lowest average solar insolation numbers for a given month. Even though the area provided 4.5 hours per day on average annually it dropped to 2.3 hours per day in January and February. If you are in a suburban or urban area with restrictions on these types of power setups or have poor solar insolation a generator rigged to work on natural gas is the way to go. Small flexible panels can be used to charge devices in a pinch but should also be coupled with batteries to store energy. I keep a 10W panel on me when in the back country and store it in my truck when traveling since I like to use my phone for maps, navigation, reading etc. Last edited by Shark0311; 26 September 2018 at 22:17. Well, since the hurricane is past us now a couple of notes. 5kw generator worked fine. The cheep siphon I got didn't work. The bulb worked fine but the hose was so soft and curly when you got it in the tank of the truck it curled up out of the gas. So had to go old school with a length of refrigerator hose. Solution - get one more 5 gal gas tank for another day before I have to go to the truck gas tank - and keep the old school hose handy. Wife made a menu for a few days but didn't check the pantry for staples. Was short a few key ingredients. Do a better pre hurricane stables check. Change in plans again. 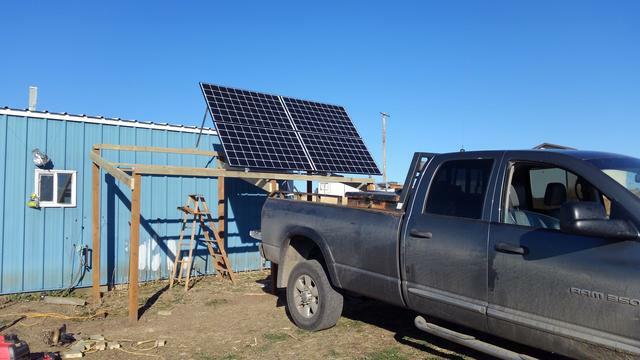 Got tired of getting jerked around by the power company so back to a full solar setup. Picking everything up on Monday. Currently set at 1220 watts of panels, 8 Trojan L16-RE batteries, 1500 watt invertor, and IOTA charger for using the generator as back up during December and January. I think we will end up adding two more panels next year, but wanted to see how things performed on the four first. Going to be finalizing my water system at the same time so it's going to be a busy week ahead. You should check to see if there is a propane conversion kit for the generator. Propane tanks are easier to store, in that the propane doesn't 'deteriorate' like gas. Plus, if you have a propane tank for the house, the gas company will install a manifold so that you can run the generator off that much larger tank. The propane conversion kit I purchased also included the proper parts to convert from LP to NG. For you guys converting to propane how much of an efficiency difference is there? I've read somewhere around 6-8% which is worth it to me to not deal with buying ethanol free gas and refilling all the time. My appliances are mostly propane anyways so being able to supply off the big tank would be a bonus. Otherwise I might just put a dedicated 100lb tank I have. No, I looked up the optimal azimuth and angle and it remains stationary. By using the unneeded sat dish bracket, the fine tuning was much easier. Do you think that inverter is big enough? That's not even enough for one 15 Amp circuit. I would consider at least a 5k and get a pure sinwave to protect electronics, the hybrid ones, well, Aren't. My little set up has about 20% the capacity of yours and I have a 3000 watt Pure Sin-wave on mine. Its fine for running power tools, shop vac and the fan and lights in the Greenhouse. I'm going back and forth between getting a 2000w one. It's less than $100 difference. I figured up our electricity usage and talking with one of the guys at Backwoods who speced out the system he thought it would be enough. It is a Samalex pure sine. I agree though bigger would be better. The biggest draw we will have is washer and the gas dryer because of the motors and blower. Our fridge and range/oven are all propane. Wood heat, and propane on demand water heater and LED lights. I've got the batteries split into two banks of four and went 24v. I do think we are going to have to use the generator a fair bit December-mid February. A wind turbine is also potentially in the works to help especial at night and during the winter. You have the panel equivalent of a 50 Amp panel, about one quarter the size of a typical home. I am not all that familiar with 24 volt systems, but 8 of those batteries can hold provide between 1800 and 2400 amp hours, which at the high end will easily supply the 50 amps of power for 48 hours. The inverter you have only allows you to draw at the most, 15 amps, that's the equivalent of 1 x 15 amp circuit, like the one you have in your bedroom. I really don't think you can run your house on one 15 amp circuit. Someone set me straight if I am wrong, but I still think you have way way more capacity than you have output for. 1220 watts / 24 Volts = APP 50 amps, you have the ability to output less than a third of that. The 1500 watt inverter will barely run your fridge when the compressor runs. You should also make sure that your charge controller will manage enough charge so your panel output is app 65% - 75% of the controller capacity, I would say an 85 amp charge controller should do it if you need to add panels. Without the need to power a well pump - 5K inverter will handle the full start up (surge) of most houshold appliances - but not always 2 appliances at the same time. TFG and Sixgun, Our house isn't a typical house per say. It is a metal shop building which is 30x40 with a 30x25 area framed out into living quarters. Our plan is to live in it for next 3-5 and save more money for building a future house and well. Having no well we have a 2500 gallon water collection system coming off the roof. All the future outbuildings will have water catchment as well for our animals and garden. Ideally I'm going to add another 2500 gallon cistern next spring to sure up the water. Based on my calculations though even in the driest months I should be getting 400 gallons/month based on local weather data. If that still isn't enough we can buy water at .13/cuft from town. Really the only appliances we have that use electricity are the washing machine and dryer and the UV filter for the water system. I make coffee with a pour over funnel, toast on a toaster that goes over the burner on stove, no microwave, dishes done by handwashing. Even our range/oven doesn't require power. Sure there are other things that get used here and there but not all at once. The only uncertainty I have is the dryer and if it can't keep up I'll use the generator to run it in the winter when clothes can't hang on the line. I may very well be way off base with what I've calculated and I'm open to any suggestions you both have. With the above criteria do you still think I should increase? When I initially talked to the guy at Backwoods Solar he put the system together based off all the appliances we have. I'm headed up there Monday to pick everything up and the components are still upgrade-able if I want. One of the Magnum 4000w 120/240 would be ideal but blows my budget which got really blown apart doing dirt work, rocking and a septic system . Got panels mounted on what will be a future Greenhouse. Have a bunch of 3x8 double pane windows that will be angled in the front to make up that wall. Really only need the greenhouse to get starts going early and finish off potted stuff when the angle of the sun is low, so having the roof shaded shouldn't be an issue with lighting it. I did heed the advice and went with a bigger 4kw/7kw surge invertor. The guy at the solar place uses the same wattage one but 48v and loves it. Going to add two more panels as soon possible to bring the array to just over 1800w. Last edited by wowzers; 17 October 2018 at 20:09. Get the bigger inverter. Check to see what azimuth and angle of tilt is optimal for your LAT and LONG.